The budget master bedroom closet makeover is done as part of the $100 Room Challenge! Let the closet organization ideas commence. 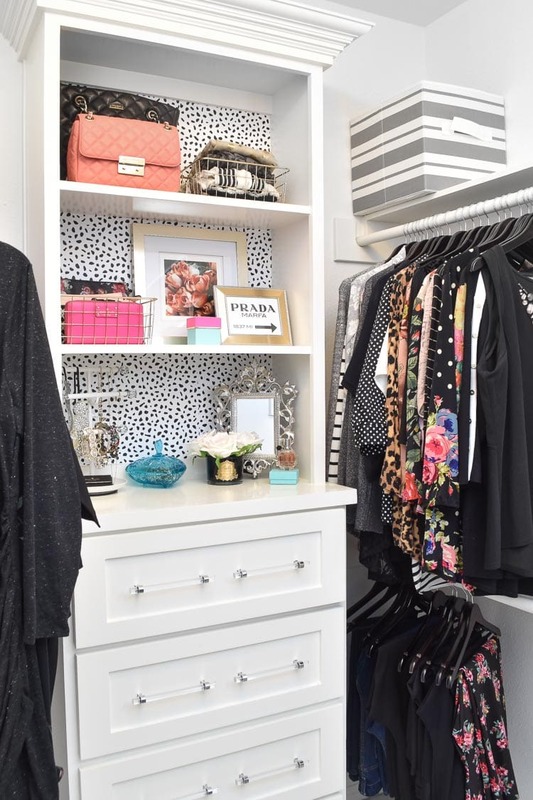 I feel like our closet has a dash of luxury, sprinkle of glam decor and tons of organization and function. 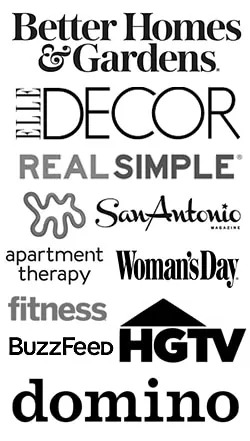 My hope is you’ll get lots of closet decorating ideas and inspiration for your home. Over the weekend I finally got the ottoman reupholstered, and I simply love the subdued vibe it has now. 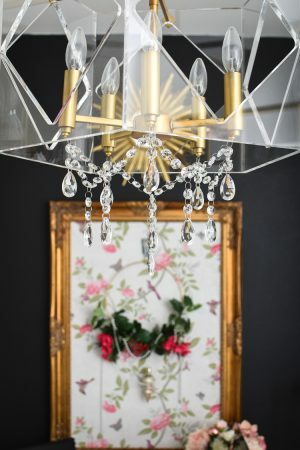 Catch up on the before photos of the closet, lining the closet shelves with wallpaper tutorial and the DIY vintage jewelry shadowbox artwork. 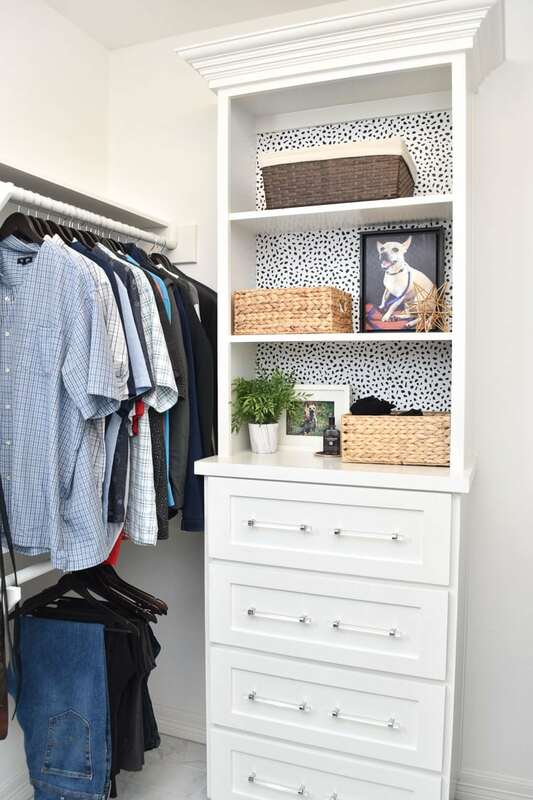 And the after… so many affordable, DIY closet organization ideas here from the built-ins to the gold baskets and fabric bins. 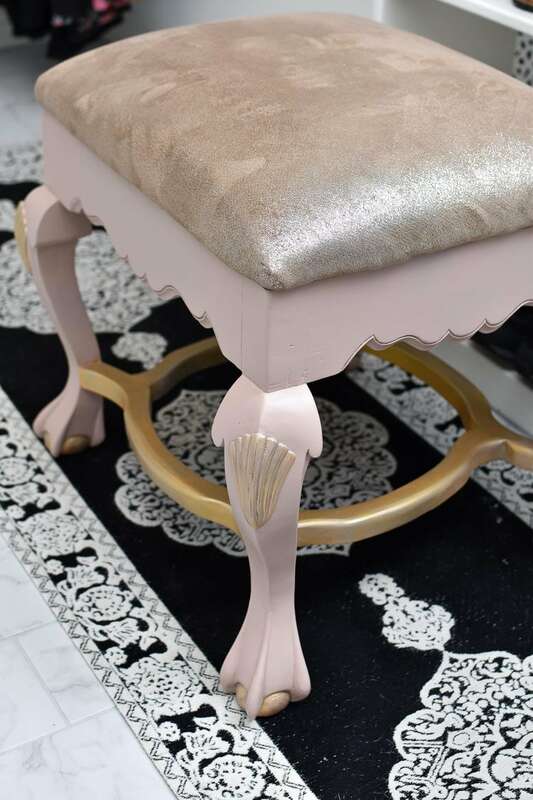 The base was spray painted with Krylon’s matte wild rose and I used liquid gold leaf to glam up the ornate details (much like I had before). The fabric on the seat is from Hobby Lobby’s fall collection. The ottoman is placed right in front of our shoe rack so we can easily put our shoes on. It’s a glam little spot! As you can see, we did not find a new rug in time, and then I decided to swipe this one from the foyer to see if it would be a great size…and it is. Looks like I’m shifting my focus to finding a gorgeous runner for this space instead of a 3×5 rug. The one major thing I just couldn’t get accomplished was spray painting the drawer pulls…BUT I will get to it eventually. 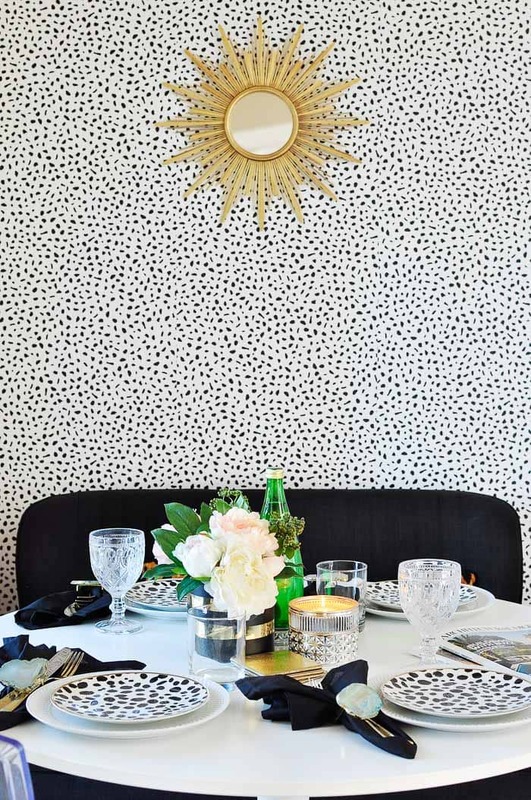 Lining the shelves with black and white speckled wallpaper made such an impact in the space and really gives it some oomph. I highly recommend a fun design on the back of built-ins to add style and personality to the space. Wallpaper, fabric or even gift wrap can work! My husband’s main request is for me to keep his “stuff” stylish, but masculine, which meant I kept his shelves minimal, functional and they feature our dear Pee Wee. 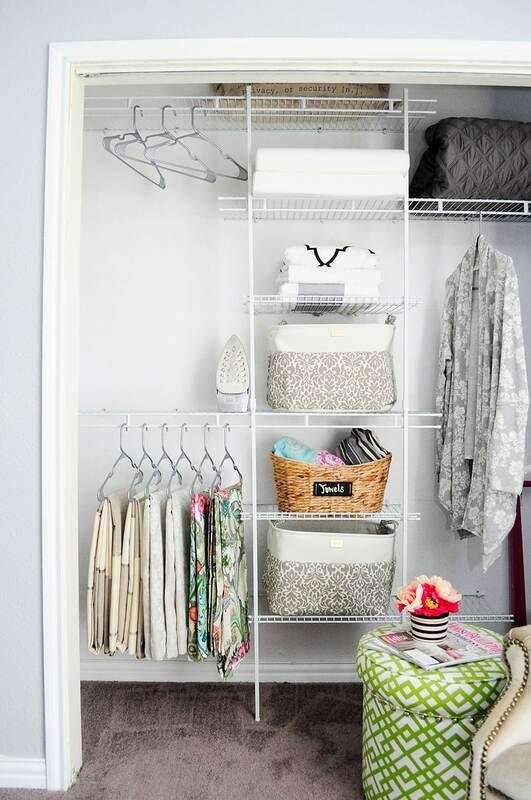 You cannot beat how easy and affordable it is to throw stuff in baskets in a closet. My husband stores his socks in the baskets you see here, and it frees up drawer space for bulkier items. My side is a bit of a different story, as you can see. I incorporated some gold wire baskets for storage for my wallets and wristlets next to a floral art print and a DIY Prada Marfa printable. 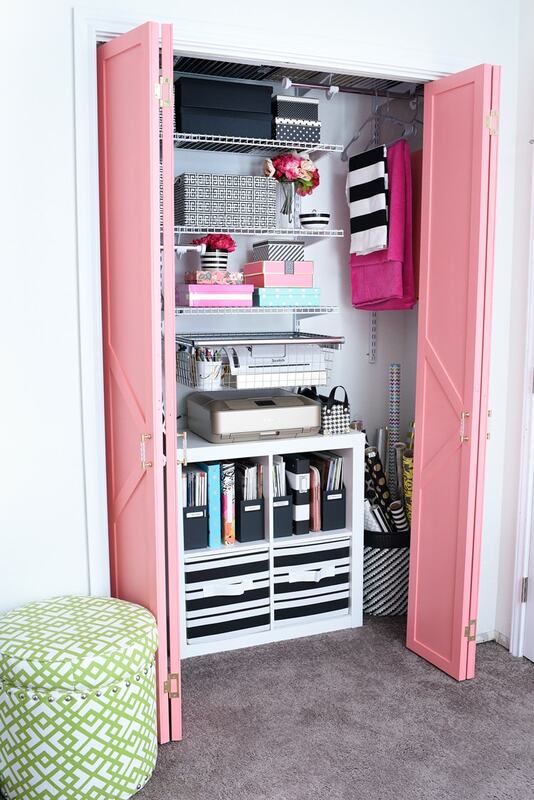 Lots of little gold baskets and punches of pink make for chic closet organization ideas in my book. When decorating a tight or small closet space, I recommend trying to keep the finishes minimal- my husband’s side has more organic baskets and mine is gold and metallics. My scarves are neatly folded up top next to my two most favorite quilted handbags. If you want to display your purses or handbags, make sure you dust often! On the bottom shelf, I have my jewelry stuff and a fun ornate mirror I picked up at HomeGoods over the weekend specifically for this spot. 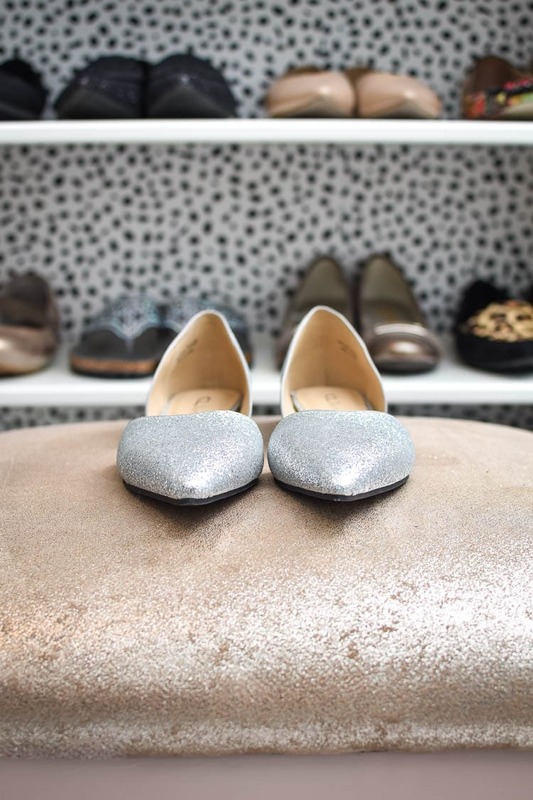 It’s nice to be able to get dressed in such a fun space and now all of my jewelry, shoes, handbags are in one spot. This totally must be like what celebrities feel like, right? Totes. Initially I wanted to display all my handbags, but opted to keep most in their dust bags for practical reasons. Now they’re all in their dust bags AND in those gray and white bins I had laying around that now sit on top of shelves. I divided them into two bins- one for more fall/winter handbags and the other for spring/summer. Our shoe rack shelving unit holds all of our shoes and my grandmother’s vintage jewelry that is now beautifully displayed in some shadowboxes. 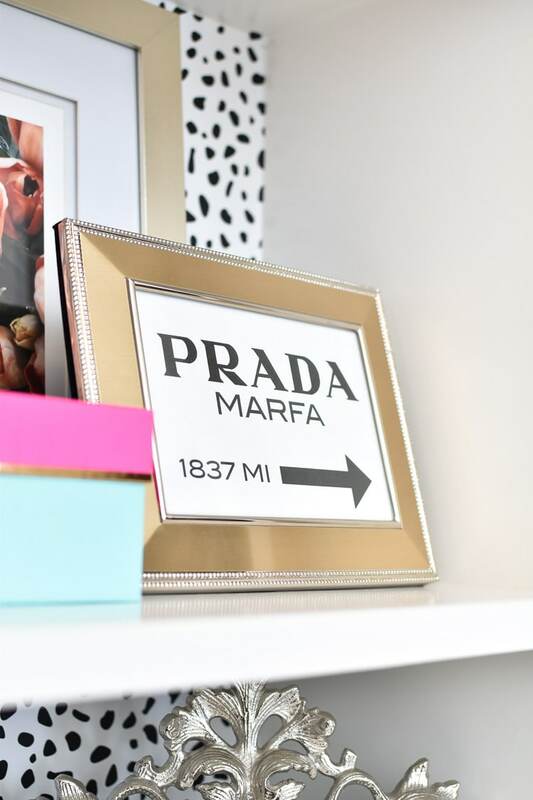 The DIY jewelry shadowbox art was one of my fave DIY’s for this closet makeover. Plus I had the supplies on hand. 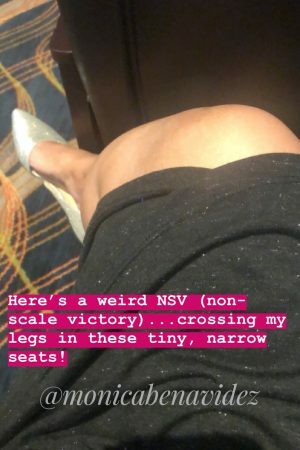 As you can tell, no glamorous heels in sight mostly because I place a tremendous amount of value on not breaking an ankle. But, I do love all of my cute and stylish flats that keep me on the ground. This budget master bedroom closet makeover was fun, and it forced me to clean-up and implement some of my closet organization ideas. It was also fun to get creative with finding useful ways to add decor and not waste any storage or organization space. Yasss! I stayed under budget. Woo hoo! I’ll have to take those $10 left over and treat myself to some ice cream or something over the weekend- I’ve earned it for sure. Adding storage space and function to closets is kind of my thing. If you’re thinking of installing a closet system soon, these posts will help you. wow, just wow!! I am amazed! Maybe I should have tackled my closet for the #100roomchallenge because not sure I can see the floor in mine and yours looks AMAZING! So inspiring! It looks so awesome!! 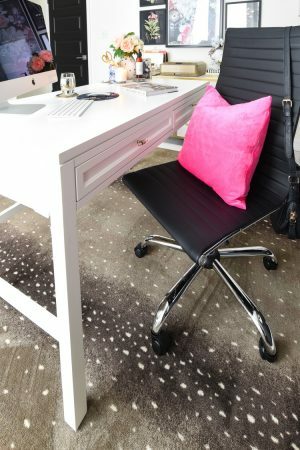 Glad you have a space to make you feel great every single day! This is the prettiest closet I've ever seen! Now I'm really inspired to do the same to my closet! I think I'd like to move into your closet! That footstool is perfection, and I love the wallpaper accent. I feel like if I had this closet, I'd have to get nicer clothes! Looks so good! Love how it all came together. Yep. I'm pretty sure this is exactly what celebrities feel like 🙂 This space is absolutely incredible!!! And I love that runner in there, even if it's only temporary. I works perfectly with everything you have. Another amazing makeover for you! How pretty Monica! So glam and only for $100 which is amazing. Love the little stool! I love your closet makeover Monica. You made the space look like a high end closet. I’m inspired! Love it! It’s absolutely fabulous!! This really looks amazing you really did a fantastic job with your $100 budget so very glamorous and chic. A closet and gal would want to get dressed up in. Oh I love it. It looks so glam and organized too. How fun to get dressed in a pretty closet. Great job. Cute! 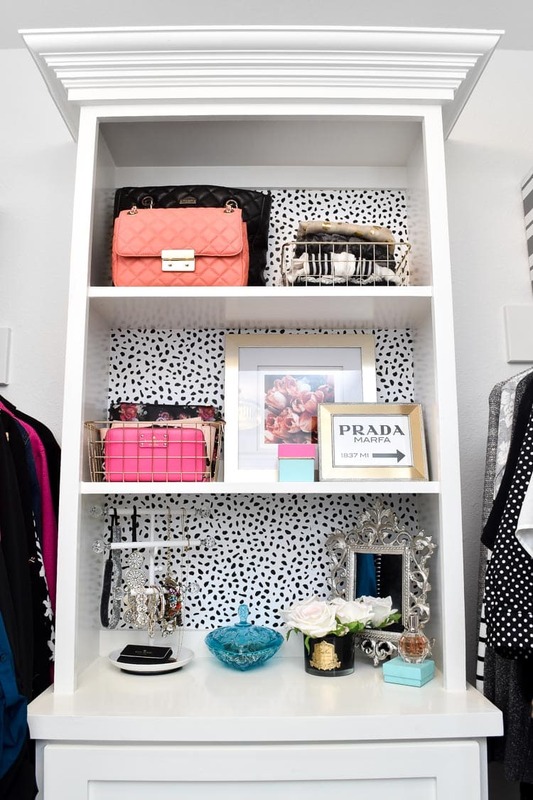 Put it on the #closetgoals list for sure!